With the Bivariate Copula Fit window, you can fit a bivariate copula to spreadsheet data. the higher the value shown in the list, the better the fit. AIC and the other Information Criteria are superior goodness of fit statistics to other fit ranking criteria (e.g. chi-squared), because they take into account the number of parameters estimated, and penalize for overfitting: a model that has a good fit using fewer parameters is preferred over one that needs more parameters. The AIC is the least strict of the three in penalizing for more parameters, while SIC is the strictest. More information on these can be found here. When fitting a bivariate copula, the copula direction that best matches the data is chosen. If you do not want to vary the copula direction and just use the copula with the default direction, use multivariate copula fit instead. Different types of output are possible, like the fitted parameters themselves, or data generated from the copula based on them. You can read more about the mathematical details of copulas here. To see the output functions of this window, click here. When opening the Bivariate Copula Fit window, you are first asked to choose which copula(s) to fit. This selection can be changed any time later on. In the Source data region, the location of the source data in the spreadsheet, and its orientation (in rows or columns) can be selected. Next shown is the list of Correlations (i.e. fitted copulas), ranked by SIC, AIC or HQIC criterion. Click one of these three to rank the fitted copulas according to it. Copulas for fitting can be added or removed for this list by pressing the add and remove buttons, respectively. You can mark the check box to choose whether or not you want to include the (unavoidable) uncertainty in the fit. To read the motivation behind this parameter click here. The uncertainty parameter is common to all ModelRisk fitting functions. It allows the inclusion of uncertainty about the fitted model parameter estimates. Unfortunately, it is common practice in risk analysis to use just the maximum likelihood estimates (MLEs) for a fitted distribution, copula or time series. However, when there are relatively few data available or when the model needs to be precise, omitting the uncertainty about the true parameter values can lead to significant underestimation of the model output uncertainty. The Uncertainty parameter is set to FALSE by default (i.e. returns MLEs or projections based on MLEs) to coincide with common practice, but we strongly recommend setting it to TRUE. Uncertainty values are then generated for the fitted parameters using parametric bootstrapping techniques, which has the great advantage of allowing correlation structure between uncertain parameters and non-normal marginal uncertainty distributions, the latter being an important constraint of more classical methods based on asymptotic results (i.e. when the amount of data approaches infinity). With the Chart mode buttons below the preview graph, you can switch between showing the source data, randomly generated data from the fitted copula, or a combination of both, as well as the number of generated points to be shown. With the Output mode buttons below the preview graph, you can switch between exporting the parameters of the fitted copula, randomly generated values from the fitted copula, a combination of both or an object. Clicking the “Create report” button above the chart will produce a fit report in a new Worksheet with the fitted models in a table. The table will have the fitted Copula objects and Goodness of Fit rankings. The report will also include the OptimatFit function that automatically returns the best fitted model according to the selected information criteria. An example of such report is available in the following example model. For explanations about other fields, buttons, graphs and summary statistics tables in this window, see Common elements of ModelRisk windows. 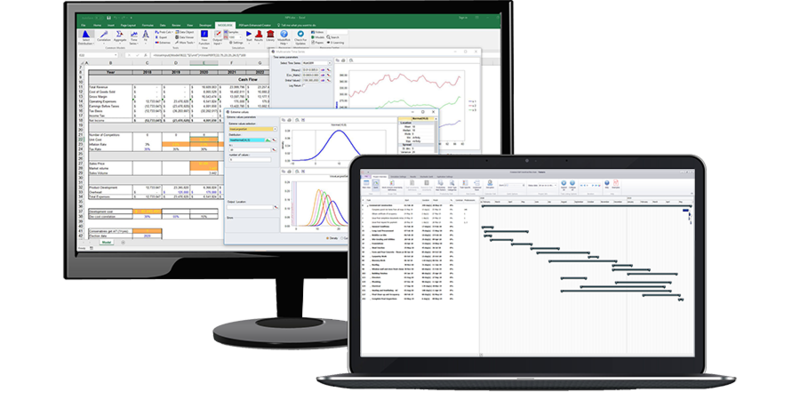 The output of ModelRisk windows always corresponds to VoseFunctions (the functions ModelRisk adds to Excel) being entered into one or more spreadsheet cells. You can always re-open the window for a ModelRisk function that is in a spreadsheet cell by using View Function. Select the spreadsheet cell and then select View Function from the ModelRisk menu/toolbar/ribbon.